Fear is a funny thing. We are afraid of fear. We will do almost anything to avoid fear, but we never really take note of how much we live in fear on a day to day basis. Odd, isn’t it? Fear can be an enigma. Most of us don’t really think about it but we can be afraid of a lot of things all the time. Because of that, we don’t realize how much stress and anxiety it creates in our life either. For example, how often do you feel anxious? How often to you find yourself worrying? These are varying shades of fear. Fear can be classified into two major categories. One is legitimate fear and the other is manufactured fear. Going for a walk in the woods and being charged by a bear, is legitimate fear. Being afraid of being attacked by a bear when there is no bear present, is manufactured fear. How you handle each situation is different, though. If you see a bear, run. 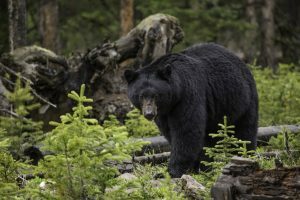 If you are constantly worried about running into a bear when you are out for a walk, all that does is ruin the experience of being out for a lovely walk. It takes courage to overcome manufactured fear. That courage comes when you start to listen to your own manufactured fear and start to push back. Challenge it. Ask “why?” Manufactured fear creates a lot of shadow demons in our lives that only keep us small. They dance in the background recesses of our mind with threatening statements that create the “what if” scenario’s that never really manifest. All they do, at the end of the day, is keep us in a mind state of feeling unhappy, miserable, small and afraid to embrace life the way we want to enjoy it. It erodes our self-esteem and makes us feel incapable of ever accomplishing anything. It takes more courage to stand up to your own inner fears that is manufactured by the ego. Why? Because it is an ongoing battle that no one ever sees. No one can help you here, except you. There are no white knights to save you. Clients are always surprised to learn that fear will always be there. It never goes away. Even the most confident of people still deal with fear, every single day. The difference for confident people is that they know where the battle line is, and they step up to it every day, secure in the knowledge that today they can overcome this manufactured fear once again. Atherton Drenth is the author of Intuitive Dance. Building, Protecting & Clearing Your Energy, and Following Body Wisdom. Atherton also appears in the documentary, Voyage to Betterment”as one of 12 experts along with other internationally renowned physicians, researchers, and pioneers in the fields of consciousness research and spirituality. Atherton is a Clairvoyant, Medical Intuitive, Holistic Energy Practitioner facilitating transformational healing for her clients. She has an international client base and has been in private practice for over sixteen years.